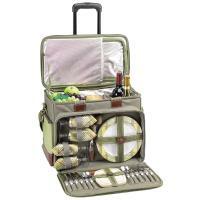 Insulated 6 Bottle Wine Carrier and cooler Bag with an integrated trolley. The Cellar from Picnic Time, Inc has been designed with functionality in mind. DIMENSIONS: 17" x 14.25" x 7.5"
This product has replaced my over the shoulder lunch box and also has room for my daily planner and a magazine in the front pocket which frees up another arm. I choose to take a 64 oz container of filtered water to work with me each day as well as breakfast, lunch, a snack and ice pack. There is plenty more room in this tote and I foresee it being used for summer outings. I can't say anything negative about it's uses except that it does tip sideways if it is pulled over a bump, dip or uneven area. Pulling it over slow usually helps minimize this. Great product! I had an issue with the first trolley that was sent to me, but your website corrected it immediately. I'm thrilled with the service that you provided as well as the product. I will absolutely shop with the company again. This is a fantastic product, good quality, excellent customer service! The personalized logo are well made. All our sales staff and clients are really impressed with the look. Well made, and the trolley that can be removed to have a six bottle bag is a great design. As a liquor supplier, this product fits my needs perfectly. The metal frame is sturdy, fabric thick and durable and this tote offers a lot of flexibility thanks to the adjustable dividers inside. Overall I am very happy with my purchase. The outside pocket is also roomy enough to fit an 8x10 folder. I sell wine in Manhattan so I needed something in which I could lug bottles to clients. 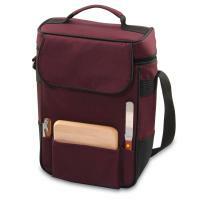 This bag can hold more than 6 bottles (without the lining many more) and is very durable. It is a good bag to use when several bottles need to be moved. I feel secure filling it fully with wines and the wide strap protects my shoulder from the weight. 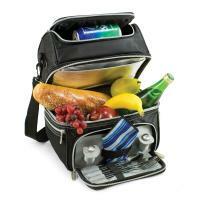 The individual compartments protect the bottles and it seems very durable. Convenient also with wheels and easy to navigate around. I would highly recommend this carrier! The bag is of quality! The only disadvantage with this product is that the trolley is not well integrated with the case, so that the case is not that well-balanced on the wheels. Great construction. Wine stays well-insulated. The trolley is much sturdier than I expected as well; I've hauled three stacked cases of wine down steps with it. Only complaint is that it's a little awkward fitting the bottle divider back in, but the job does get done eventually. Very nice product. Very nice quality bag. My husband uses it for work to carry samples, but I am looking forward to using it with the interchangeble cooler liner for picnics in the summer. 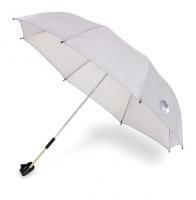 The trolley is also nice quality, and the bag can be removed and carried without the wheels. I use the bag every workday, and I am very happy with in comparison to past bags that I have purchased. My only critique is that the rings that attach the bag and are connected to the shoulder strap could use to be reinforced. With the daily use I put the bag through selling my wines, the rings begin to separate further and then detach itself from the bag completely. Yet, like I said it remains the best wine bag I have ever worked with. The insulated material keeps the temperture of my wines at their optimal level and it is a comfortable bag to carry even when it is overloaded with more wines than it has spaces for. 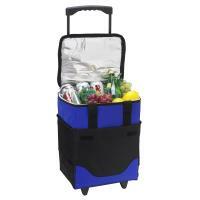 I bought two of these totes as we were going on a cruise and needed some way to bring aboard our wine and other liguor. These were the perfect size and stored nicely. I really liked the additional pocket in front. It was plenty big and I was able to take everything I needed in the tote. The one thing that I liked when I ordered these also became the one thing that ended up being a minor problem. I liked the fact that the tote could detach from the trolley. This caused a problem when I had to pick up the tote and trolley to put through the x-ray machine. I had to remember to hold the bottom handle on the trolley when I wanted to just keep picking up the tote itself. Since the tote was not attached it also had a tendency to fall to the side off of the trolley. These were minor issues but did cause some problems. Overall I liked the tote and can see many uses for it, with and without the trolley. The item is just as nice as described. I am not happy with this product because I thought it was a wine cooler on wheels and not a wine cooler with a separate dolly. I used to buy a wine cooler on wheels from Picnic World that was so simple and I can no longer find it. It was a 6 bottle wine cooler and had a white panel in front. • Shipping Carton Size: 18" x 18" x 6"
• Shipping Weight: 8.3 lbs.